Friends of Big Bone and their partners- park personnel at Big Bone Lick State Historic Site, and the Cincinnati Museum Center celebrated the completion of the four year Revitalization Project of the Visitors Center at BBLSHS on September 7th, 2017. Donnie Holland, Kentucky Parks Commissioner, and Dr. Glenn Storrs, head of vertebrate paleontology at CMC, gave the opening remarks regarding the project and the park’s historic and prehistoric significance followed by light refreshments and a chance for the public to see the recently finished project. Done in three phases, the project began in 2014 and saw Phase I completed in May of 2015 with the installation of nine thematic cases that covered Big Bone’s history and pre-history from the Ordovician Era to the 21st century. In June of 2016, Phase II, the completion of the Bison Antiquus diorama was revealed, and in August 2017, the skeletal reconstruction of a Harlan Ground Sloth was installed complete with a recent find at the park, a tibia of a Harlan Ground Sloth. The Greater Cincinnati/Northern Kentucky region is fortunate to have an historical gem in the form of Boone County’s Big Bone Lick State Historic Site, which may be described as “a diamond in the rough.” Big Bone Lick has been designated the birthplace of American vertebrate paleontology. Historians and scientists have long recognized the importance of the Big Bone Valley, but a lack of resources in the past have prevented the effective display of the large fossil bones that gave the park its name. Thus the stories surrounding this designation were inadequately known to the visiting public. The partnership between Friends of Big Bone, Kentucky State Parks Personnel, and the Cincinnati Museum Center has enabled the park’s Visitor Center to promote the significance of the Big Bone Valley and provide visitors a better understanding of the unique value of Big Bone Lick State Historic Site. There was some rearranging on the Phases still to be completed and now Phase 2 has become the Bison Antiquus and 3-D wall extension. Now in June, Phase 2 is 98% complete! The visitor's center is excited to show off their new addition. In February, FOBB met with members of the Exhibit Team from Cincinnati Museum Center (CMC) at the park. The partners, FOBB, CMC, and park personnel, discussed how to move forward on Phase 2 (Harlan Ground Sloth skeleton) and Phase 3 (enlarging the wall mural). It was decided that the $41,000, from 2015 fundraising and matching funds from the R.C. Durr Foundation, will be used to create a 3-D effect for the wall mural. A Bison Antiquus, also known as an ancient Bison, will be displayed at the far left corner of the mural. Raised to the level of the picture, it will be tied into the contents of the mural as the Exhibit Team develops grasses, rocks, and ground along the bottom span of the mural. Signage will be included. In addition, audio-visual equipment will be installed so that programs and information can be displayed by park personnel to better educate the public on the history of BBL. This part of the Revitalization Project will be completed by the end of late Spring 2016. Once it is completed, the Project Committee has one more phase to address; the inclusion of the Harlan Ground Sloth skeleton (Phase 2) which should be completed sometime in 2017. The R.C. Durr Foundation intends to continue to match all donated money dollar for dollar till Dec. 31, 2016. Thus plans for future fundraising are ongoing. FOBB encourage the public to Be a Part of Something Mammoth and help the partners for the Revitalization of the Visitors Center reach its new goal of $60,000. FoBB submitted its fund-raising report to the R.C. Durr Challenge informing the Foundation about the $20,500 collected which the Foundation matched dollar for dollar, giving FOBB $41,000. The Foundation also extended the Challenge for another year which will end at the close of 2016. The partners (FoBB, BBL park personnel, and CMC) will meet in January to discuss with the Exhibit Team on how best to apply the money to the Revitalization Project. Fundraising will begin again in late winter/early spring to begin the process of gathering donations in order to complete Phases II and III in 2017. Our goal is to collect an additional $50,000 in order for the R.C. Durr Foundation to match it dollar for dollar. 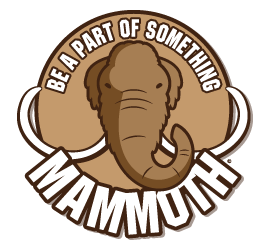 Become a Part of Something Mammoth and help the team complete Phases II and III! We have raised a total of $20,000! That is amazing to us and want to thank everyone who has contributed and shown their love for our project. We still have a long way to go to reach $70,000, but we know it's possible. Please help out and donate. Don't forget to share on Facebook, Twitter, and let your family and friends know about our great cause. And as always, thank you for Being Mammoth! The cases, which highlight some of the significant moments and discoveries in the history of Big Bone Lick, were unveiled at the visitor center Thursday. The display, the first phase of a three-part project, was the brainchild of the Friends of Big Bone and was made possible by a $70,000 grant from the R.C. Durr Foundation. The unveiling event, which was open to the public, included Secretary Bob Stewart of the Kentucky Tourism, Arts and Heritage Cabinet and Elaine Walker, commissioner of the Kentucky Parks Department. Stewart said there are several “friends” groups throughout the state, but none more committed than Friends of Big Bone. We launched an IndieGogo campaign on April 15th to help bring awareness to our efforts to raise funds for the Big Bone Lick visitor center renovation. The campaign on IndieGogo ran for 30 days and raised $2,400 in donations. We offered a variety of perks in addition to donations, from books about the people and animals of Big Bone Lick valley, one of a kind experiences such as a Bison Encounter and Dinner with Fossils, to campaign exclusive items such as a t-shirt and tote bag.